Things make sounds. Some things we use turn sounds into music. We expect that of musical instruments. Yet human beings have always made everyday sounds meaningful by pounding, rubbing, plucking, rattling and other interactive acts with real world stuff to turn the aural into avenues for communication, exploration and expression. Silvie Deutsch tethers seven handmade and spare instruments right into the gallery structure. It’s a melding that encourages us to consider the collaborative nature of sound making and music as an act of auditory discovery. Deutsch’s installations are frequently poetically remapped spaces of metaphor and the physical labor of construction. In the past she has sewn together three-dimensional dressmaker’s patterns into complex bulging walls that made the absence of the human body and the invisible makers of clothing tangible. For “62 Miles of Girl Talk” she stretched that many miles of pale plastic line from wall to ceiling to wall, making a sharp peak of hundreds of near invisible lines along the length of a gallery. The taut construction effectively re-presented the narrow but invisible distance between the earth and the edge of the vacuum of space as a cosmic, but playable acoustic harp. Walking through the harp, the audience and performing musicians could strum and pluck to make resonating chords and auditory patterns. These were recorded and paired with a recording made of women whispering as they created the work. 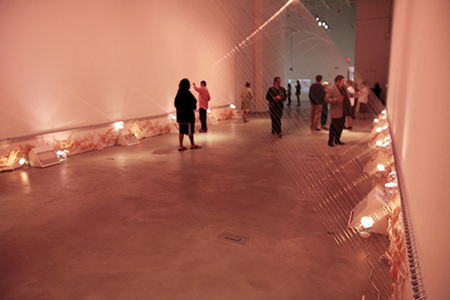 For this installation, Deutsch says she recognized the need for creating connection in a stressful time. She offers “Play” as an opportunity to not only create temporal compositions and music but to play — in the collaborative, exploratory manner of childhood. Her seven sculptures are shaped like abstract harps and piano beds. Each is either tethered to, suspended from or lies prone within the gallery, so as to invite interactivity by visitors. They will also be played by a group of seven musicians at specific events. John Cage once said, “A sound has no legs to stand on,” meaning sound itself is nothing; it requires support structures and vessels to be made. We are accustomed to the invisibility of sound and the way it pulses through every surface and into our bodies, filling our rooms and penetrating our daily lives. We also tend to completely forget the bodily labor that goes into making any kind of aural surface. But in Deutsch’s hands these peripheral elements are the very ones we are asked to reach out and touch. That she frames all this as a creative encounter is a reminder that we are always making and embedded in a kind of music; even when we aren’t aware of it. Justin Favela’s “Gracias, Gracias, Thank You, Thank You” is a delightfully smart critique on contemporary commerce and the art world in general. By adopting traditional piñata ruffled tissue paper and cardboard construction, Favela uses what is considered a lowly paper craft from Mexican culture to interrogate the more lofty economic and social expectations of those who look at art’s objects in galleries. Central to that examination is “Gracias” a fragile fruit stand sculpture displaying bright, tissue paper oranges. Like the exhibit’s longer title with its multiplied declarations of gratitude that also convey a subtext of financial need within a polite but limited conversation, this work is a subtle bid for deeper queries around direct cultural exchange. A fruit stand in local Latino culture is a place of meeting as well as commerce. Building on previous works like his public “Family Fiestas” performances held at art sites such as Michael Heizer’s “Double Negative” in Nevada, Favela’s “Gracias” offers the art gallery as a similar place for communal interaction. Within art’s meeting place however, Favela’s piñata sculptures suggest there are larger social realities to be addressed and considered. Indeed, his frilly sculptures exhibit an awareness of their piñata-dom role in society: to be beaten unrelentingly until they spill out all that they contain for others to consume. The colorful Sesame Street character “Big Bird” lies in a dejected, splayed heap on the floor, awaiting its turn to be strung up and battered. The rainbow-colored “Donkey Piñata” sags hopelessly from its suspending rope. In its helpless four-footed droop we see suggestions of Maurizio Cattelan’s suspended taxidermied horses, tapped and unable to escape situations they had no part in creating. Favela’s party piñatas are a similarly haunting metaphor dressed up in party colors. It’s a good insight for a time when the human costs of broad public policy decisions affecting so many lives are being glossed over.